I am a camera with its shutter open, quite passive, recording not thinking. Recording the man shaving at the window opposite and the woman in the kimono washing her hair. Some day, all all this will have to be developed, carefully printed, fixed. Those three sentences make up the second paragraph of Christopher Isherwood's Berlin Diary, which is dated autumn 1930. The four photographs were taken by me during my first visit to Berlin in 1973, at the height of the cold war - see Final approach to Berlin. They were taken on black & white film using an Olympus Pen S 35mm camera. They were then developed, carefully printed, fixed and mislaid during one of our numerous house moves. I found them a few weeks ago at the bottom of a drawer, and they have never been published before. The header photo was taken close to the notorious Spree River crossing point. It shows the memorials to those who were shot while attempting to swim the river and escape to the West. 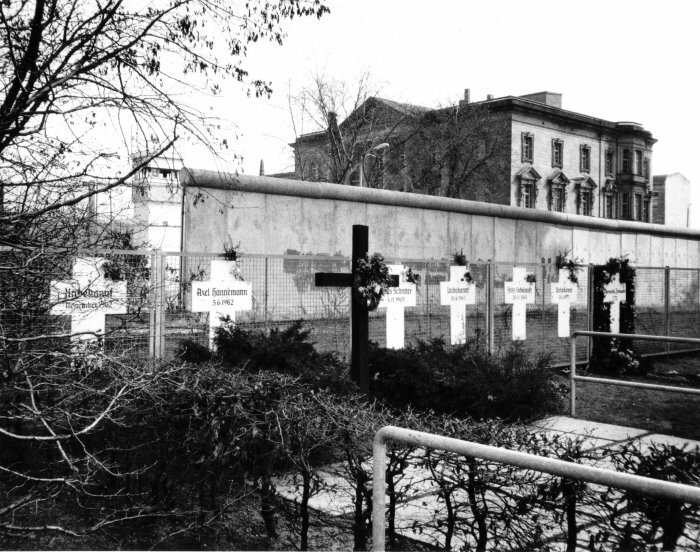 The two memorials on the right are dated 1973, the year of my visit. This point on the Spree can be seen in very different times in picture three of my 2005 photo essay on Berlin. There is more on the dreaded East German Vopos (Volkspolizei) who shot the escapers, together with another exclusive photo, in my 2007 article. The second and third photos were taken from viewing platforms on the west side of the wall looking across the death strip. The third photo shows Potsdamer Platz. The showpiece TV tower built by the GDR in the centre of East Berlin can be seen in the distance. Propoganda was all part of the game in those days. The old Philharmonie, home of the Berlin Philharmonic, was in Bernburger Straße close to Potsdamer Platz. It was bombed in 1943; read the story in Furtwängler and the forgotten new music, and in the Berlin Philharmonic's darkest hour. Close by is Karl Freidrich Schinkel's Konzerthaus which was built in 1821, but was a gutted shell as a result of wartime bombing during my first visit. It was rebuilt in 1979. Read about how, during the rebuilding, the GDR rewrote music history. And staying with photography, don't miss the disturbing images in the Siegfried Lauterwaser collection. Thank you for posting these photos - they're quite moving in themselves, and all the more so paired with the lines from Isherwood. Those are very powerful images. 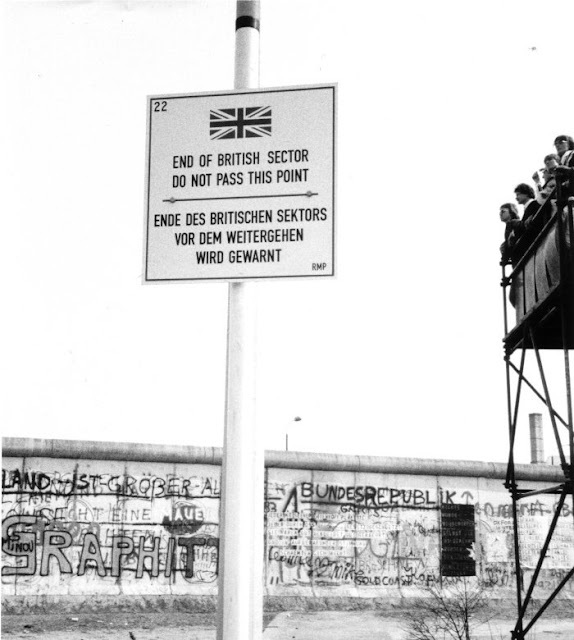 My only visit to Berlin was a few years later, in 1975, on the 30th anniversary of the end of the war. I passed thru Checkpoint Charlie also wanting to see and stand near the Opera House. But the hassling I got trying to get thru the checkpoint and the constant awareness that I was being followed during my lonely walk Unter der Linden scared me to the bone, so I only got as far as the Brandenburg Gate and turned around and headed back thru the Gate into the West. That hour or less I spent in East Berlin is still burned into my memory and the source of recurring nightmares in the 30+ years since. Some photos can be found on my photo blog. Perhaps it's time to show more of them. Richard, many thanks for sharing those memories, and for the link to your photos. I too crossed over into East Berlin via Checkpoint Charlie on that trip in 1973. My memories are very similar to yours. I remember having to exchange a fixed amount into soft GDR currency that couldn't be changed back. Because I crossed on my own I was told to leave my details and expected return time with the British Military Police at the checkpoint. I walked along deserted streets, following the landmark of the TV tower into the centre of East Berlin at Alexanderplatz. Like you, I had the feeling of being watched. My memories are of the empty windows of stores. I visited a museum, I think it was the communist incarnation of what is now the Zeughaus Deutssches Historisches Museum. Then I ate a wretched meal from a menu with no choice in Alexanderplatz, and returned to the bright lights of the West. Recalling that brief visit to East Berlin under the GDR puts today's 'hardships' into perspective. I wasn't born till...a few years after the year of your visit, shall we put it. 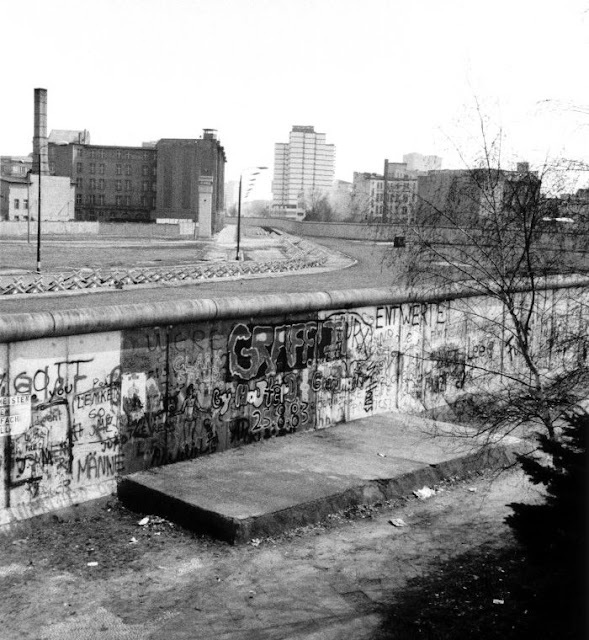 One of my first memories of world events -- that is, being aware enough of the news and such -- was hearing the breaking news on NPR of the collapse of the Berlin wall. I've always been an obsessed fan of WW2 history, and to some degree, of what happened afterward as a result of the war, and as haunting and awful are the images of the war are, the images and stories of the occupation seem to be perhaps even more so. It's hard to imagine living through WW2, only to be stuck in East Berlin. I feel that our obsession with Hitler has quite eclipsed the fact that Stalin and his regime and successors were possibly just as bad, if not worse -- because it was tolerated as a means to an end. i don´t think that these picture are from 1973. at this time the wall looks different with only a few paintings. grafitys don´t exist at this time! i am from berlin and i was 16 at 1973. BMH, it is an interesting point you raise. I took the photos myself and have the original prints which are undated. 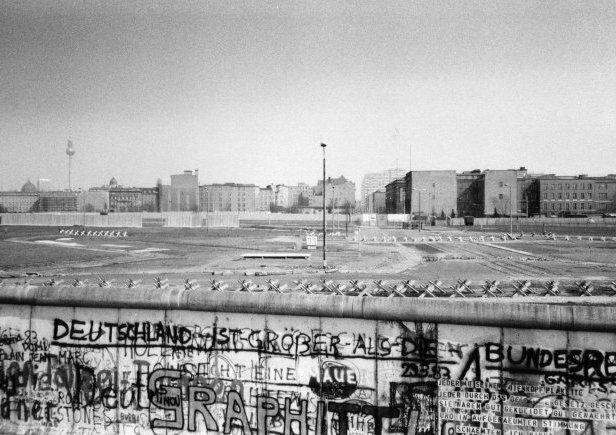 I visited Berlin several times between 1973 and 1975, and visited it again in the mid-1980s -probably 1985. I have always thought I took these photos during my first trip to Berlin. The fact that they were taken using black and white film, which I was using at that time for journalistic purposes rather than the more common colour stock, supports that. But am I wrong? From what you are saying the mid-1980s is more likely.